I’m convinced that introducing the dog to game already during puppyhood is for the very best if you want a dog that feels that handling game is the most natural thing in the world, and the very best thing too. I haven’t really got my own act together when it comes to game and my dog Tassla. Mostly for practical reasons, but also because I’ve prioritized other forms of training (we’ve just begun competing in obedience), and game handling has been put aside a bit. But in late summer and this autumn it’s time for us to debut in a lot of different hunting tests. My plan is for us to do the Water test and start in Novice. So it really is high time to deal with handling game! Tassla has got the chance to investigate and ”hang out” with different kinds of game that I’ve placed out on the lawn. She’s been on leash and I’ve not paid much attention to neither her nor the game. You can see this in an earlier post called Working with Game. We did this twice and as described in that post, Tassla then ”happened” to steal a bird that I had put on a table in a plastic bag, and proceeded to happily carry it around. Unfortunately, a bit too much time passed before we did another training session (obedience training, the winter cold and everyday life got in the way…) The next time Tassla got to carry game was a couple of months later, and again that kind of just happened. 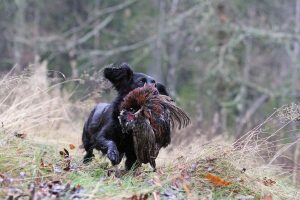 I’d been out training with her and someone gave me a nice little guinea fowl to take home. I was carrying it in my hand. When I arrived home, Totte got very happy and wanted to carry the bird. I’ve trained Totte to carry game in a slightly different fashion, which we described in the book. He wasn’t at all interested in game, but I began to bring a bird with me when I came home from work. Totte gets very happy when I come home and when he’s happy, he wants to carry something. He’ll carry a shoe, keys or whatever is at hand. I began giving him a bird to carry and he loved it. You could say that I played on an existing emotion and connected that to the bird. (A person who’d read the book just got in touch, telling us that she’d done the same thing with her dog and that it had worked beautifully! Great!) I would definitely consider doing the same thing with Tassla if there wasn’t the issue of competition between Totte and Tassla when I come home. They do get a bit too wound up and egg each other on. IF I was to do that, I would have to carry two birds and suddenly the project feels a bit cumbersome… So I’ll try a different approach and see if I wind up any wiser for it. You see, my dogs have a game that they play sometimes. Tassla grabs something and makes Totte chase her. She loves a good game of chase and he’s not really that interested in getting the thing off her, but likes the chase. This time, I think that Totte really did want the bird. Tassla really didn’t want to lose it so when she ran off; she kept an eye out behind her, afraid of losing her precious treasure… I had to laugh at them and it took me a while to catch the two and get on top of the situation. But by the next organized training session, an idea had been hatched. Catta had her Sam retrieve a gull a couple of times, while Tassla watched, We then placed the gull again and let Tassla run out to it, while I moved off in the opposite direction. Tassla ran out to the gull, poked it around a bit before she got a good grip (she tried dragging it by the wing first but realized that was a bad plan) and raced after me. We did the same thing three times and also tried putting the gull in tall grass (she seemed to find it even more interesting then). We weren’t really paying attention to the deliveries, but I made sure to reward her generously for coming towards me and I also praised her when she picked up the gull. But no nagging, she had to solve the pick up herself. The day after she got to take the gull from my hand and walk beside me, carrying it. Naturally, she was now on leash. I didn’t want her to run off with the bird, creating a situation where we’d end up in a power struggle over the game. I offered her the opportunity to deliver to my hand a couple of times and since she has a great hand target behaviour, that worked ok. At this point, I don’t want the deliveries to be about precision. I want her to be completely confident about game first. I’ve then used her great interest for retrieving to let her retrieve a frozen or somewhat thawed crow that I’ve thrown into a bush on our property. We only repeated this a handful of times, because when she gets aroused, she gets a bit thoughtless and begins chewing and throwing things around. I still don’t care much about what the deliveries look like, BUT when she does deliver to hand with good pressure, I make sure to praise her generously and give her extra special treats (raw meat). So, now this is our big project. Projects are a thing of beauty; I always work like that with my obedience training. We might run a couple of different projects in parallel during a few weeks, making sure that we really make progress on that specific exercise that we’re working on. We’ll do some kind of training with game every day during the next couple of weeks. I’ll bring a thawed bird in the game bag and let Tassla carry it for a while during our walks. We might do a blind retrieve one fine morning. I also carry a number of dummies in the game bag, and they’ll all pick up the scent of game, making the scent a natural part of whatever she retrieves. When we take a coffee break, the birds and the dummies will just be lying next to us, as a natural part of the break. As I notice Tassla being ok and enjoying this, I’ll add the birds into the rest of the training, for example when working on deliveries and casting. Catta always says that the most important thing is to not make this training into something weird and that you should avoid putting pressure on the dog at all costs. As said, all dogs are different and they’ll behave in different ways around game, but it feels like a good rule of thumb, not turning this into something special and weird. That’s another reason for including game early on, from puppyhood. That’s why it’s so easy for those whom are hunters to just make this into a regular part of the puppy’s life. The game is just there, from the beginning. One of my best training buddies struggled with getting her dog to handle game. She asked for Catta’s help, and Catta the sage watched them work with dummies (superbly!) and then with game. She then said in a kind voice: “Your dog has no issues with game, but you do…” And then she told my friend that the first thing she needed to do was breathe… My friend turned all stiff and uncomfortable and so afraid of making a mistake that she begun to act very strange, which naturally her dog picked up on. But when she relaxed, so did her dog. Sometimes that’s all it takes.